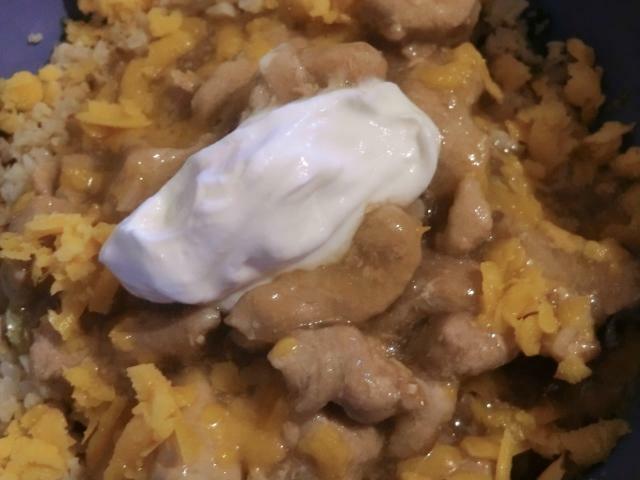 Pork Chile Verde and Cauli-Rice Bowl | Cooking is Fun … Really!! It’s cold and gray and I’m bored so I made one of the easiest lunches or dinners that I’ve had in ages using leftover chile verde (green) enchilada sauce and cubed pork tenderloin. Garnish with grated cheddar or Monterey Jack cheese, sour cream, sliced green onion tops and diced avocado. In a medium sized saute pan, heat the oil over medium-high heat. Add the pork cubes and saute until lightly browned. Push the cubed pork to one side and add 1/2 cup of water to the saute pan, scraping up the browned bits on the bottom. Add the enchilada sauce and bring the mixture to a boil. Reduce the heat until the mixture just barely simmers and cover tightly with a lid. Cook for 1 1/2 hours or until the pork is tender and breaks up into shreds when a fork is used. Check the pot every 15-20 minutes, scraping the bottom to make sure that the meat mixture doesn’t stick. Add more water as needed. Serve over rice or cauli-flower rice. Additional sides include refried beans and flour tortillas. 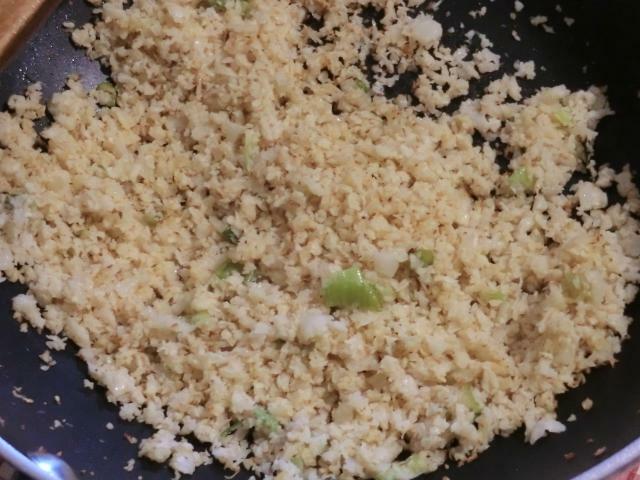 Cauliflower Rice – 2 1/2 cups of frozen cauli-rice microwaved, squeezed dry in a towel and sauteed with 1 tbsp of olive oil or butter until lightly browned. I added about 1/4 cup of frozen green onion tops to the pan and sauteed it for about one minute before adding the cauli-rice. Never had pork in my life, but I believe you! It would work with chicken too. It will? Then it’s a good one to try, thank you. Yes, just skin and bone out a pound and a half of chicken thighs and cut the meat into chunks. It should take about an hour to simmer the meat until it was fall apart tender. You could make the chile verde sauce from scratch with roasted tomatillos, onions, green chiles. This is the recipe I’d probably make if I decided to try it again. Thank you for the idea; I’ll probably make it in the Instant Pot. I tend to make almost everything in it now – love my Instant Pot! It seems to be popular. (Like air fryers some years ago.) Have fun. Air fryers are still all the rage here among the Hispanic population, but I was never inspired by it. I’ve had two crock pots for years, like every kosher kitchen, and I have replaced them both with Instant Pots (one for meat and one for everything else but dairy). One of the best kitchen decisions I’ve made! My motto is .”We try not to fry,” but I love gadgets. I think it’s the aftereffect of having been deprived of a real kitchen for many years.